Independence is an important skill for all children to have, but it’s an essential part of a Montessori education. Encouraging your child to be independent can have positive, lasting effects and contribute to their development into well-rounded, confident adults. While independence is taught in the Montessori classroom, we encourage you to teach it at home as well. If your children are able to complete and even master certain skills or lessons, they will build confidence in their ability to take on new tasks. Allow your children to choose their activities based on what interests them. 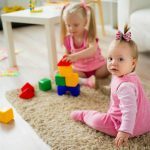 This will help them learn to be independent in choosing their activities, it will give them a feeling of pride and accomplishment when they have mastered an activity they have chosen and it will help to build confidence in their ability to make decisions. When you give your children the space to choose their own activities and make their own mistakes, you limit the need for external correction. External correction, such as from a teacher or parent, can lead to a sense of failure or stress for the child. Montessori activities tend to be self-correcting, so they teach your children when the task has been completed right or wrong without the need for parent or teacher intervention. We have mentioned before the importance of practical life skills in a Montessori education and they are one of the best ways to teach self-reliance in your child. Getting your children involved in daily home tasks helps them to learn useful life skills that they will carry into adulthood. It’s important for parents to show children the right way to complete a task and let the child attempt it themselves. Making mistakes and trying to correct them without any parent intervention is important to develop self-reliance. A combination of Montessori practices at home and a Montessori education at school is essential for your child’s success. Montessori School of Wellington in Guelph accepts enrolment year round! Start your child on the path to success with us.